In a large skillet, brown the ground beef over medium-high heat. Drain the excess fat away and return the meat to the skillet and to medium-low heat. Stir in the salsa and cook until heated through. Remove from the heat. Pour about 1/2 of the enchilada sauce in the bottom of the prepared baking dish. Warm the tortillas according to the package directions. Add about 1/4 cup of the meat mixture down the center of each tortilla and top with about 1 heaping tablespoon of cheese. Tightly roll each tortilla up and place them in the dish, seam side down. 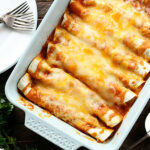 Pour the remaining enchilada sauce over them and sprinkle the remaining cheese over. Tightly wrap the dish with aluminum foil and bake for 30 to 35 minutes.